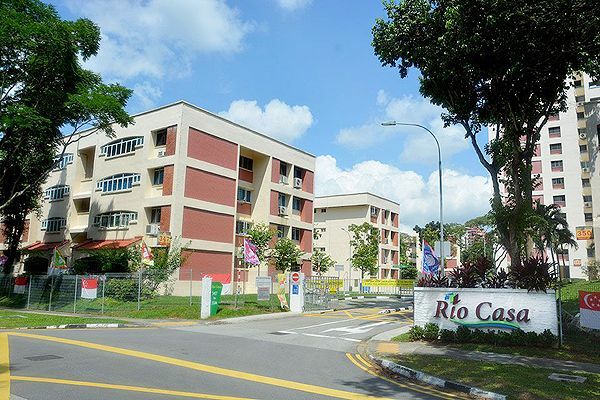 A privatized HUDC estate at Hougang Avenue 7, Rio Casa has been sold for a total of $575 million to a joint-venture between Oxley Holdings, KSH Developments, Apricot Capital and Lian Beng Group. The former HUDC comprises a total of 7 residential blocks with 286 apartment and also maisonette units, spreading across a plot size of approximately 36,811 square meters (sqm). As indicated under the URA Master Plan 2014, the site has a plot ratio of 2.8 and is permitted for a redevelopment gross floor area (GFA) of around 1.1 million sq ft. The joint-venture firm will be expected to apply for a fresh tenure of 99 years for future re-development of the site – a differential premium which will be paid to the state is estimated to be around $208 million. KSH Holdings, which holds a 35% stake in the joint-venture, noted that the firm will be funding a portion of the collective sale amount for Rio Casa via internal resources and loans from financial institutes. The rest of the stakes in the joint venture among Oxley Holdings, Lian Beng Group, and Apricot Capital will be 35%, 20%, and 10% respectively. Analysts believe that the recent boost in the market sentiments and lively sales at new launch projects have fuelled developers’ demand for such development sites, and expects such activities to continue strong throughout the year. The 1st en bloc sale this year (2017) took place at One Tree Hill Gardens – which was sold for $65 million (or $1,664 psf) to Lum Chang Group. Next up, all eyes will be zoomed onto the potential en bloc sale of Eunosville at Sims Avenue, which is also a former HUDC estate with a total of 330 units. Offers are expected to be between the range of $643 million to $653 million, or $780 to $790 psf ppr.